This soft-cover book of 218 pages includes over 200 family photographs, sketches, maps and document facsimiles to accompany the text of remarkable letters written in 1899. 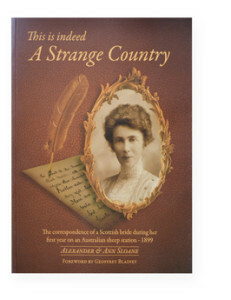 “A Strange Country” offers a graphic and intimate look at pioneering pastoral lifestyles, through the discerning eyes of a literate and intelligent young Scottish woman. Almost 40 years ago, Ian Sloane took a tour of the Yarrawonga Mulwala Historical Society through the still-furnished Mulwala Homestead. Prior to the tour, Mr Sloane produced a leather bound book entitled ‘Australian Letters – 1899’. He stated, “This is a book I can’t let anyone look at, because it is so private. My mother describes all the people and that’s why I can’t let you look at it, as she says exactly what she thought about everyone & everything.” Mr Sloane also knew of her frank opinions of Yarrawonga, and these could have caused offence. But he finished by saying, “The book will come out some day”. And after 115 years, this unique collection of letters is now available. The bound book held by Ian Sloane contained all the letters Jean Sloane wrote to her English family during her first year of living at Savernake Station, which was the northern section of the 20,000 hectare Sloane enterprise. She had emigrated in 1899 with her recently wed husband William Sloane. They had met two years earlier when Willie competed with the Victorian Team at the Bisley rifle shooting competition near London. In his foreword to the book, Professor Geoffrey Blainey states, ‘It is a valuable chronicle of daily life for just one year, of the things that happened every second day. In Australia, she saw the landscape, seasons and a way of life with fresh eyes’. This book is a noteworthy and valuable piece of Australian history, as well as an intimate portrait of the challenges and pleasures of families on the land. This is not an arbitrary collection of correspondence – it is a living, vibrant narrative of Australian social history. Some of the locations of which Jean writes are now on the register of the National Estate. Alexander & Ann and their children have built the book into a family project, their daughter Merridy typing out the original manuscript, son James helping with technological aspects, and daughter Hilary designing both the cover and layout.